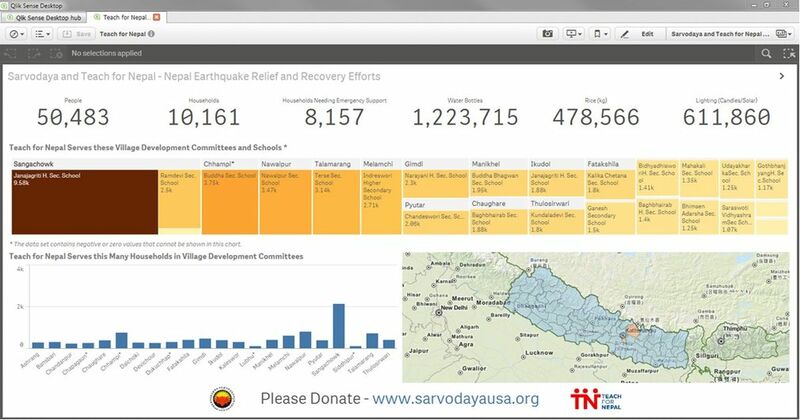 How Teach For Nepal and Sarvodaya USA used Qlik to turn a detailed relief spreedsheet into meaningful visualizations. Earlier this week, dozens more people were killed and thousands injured as Nepal was hit with a second earthquake and round of devastation. A magnitude 7.3 earthquake followed by several aftershocks rocked the area, leaving even greater wreckage and loss for those already affected by the catastrophic events less than three weeks ago. 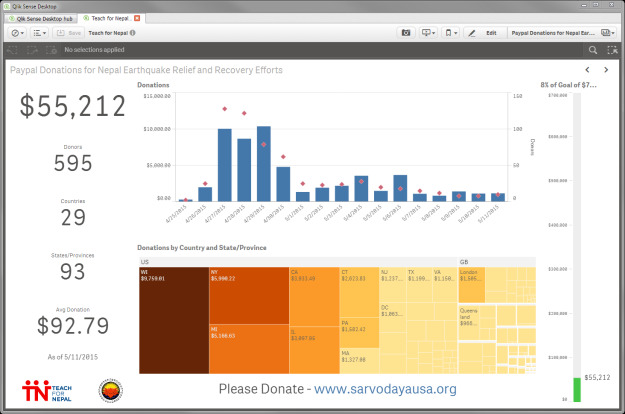 As you may have read in my last post, Corporate Social Responsibility is always on our minds at Qlik, and we're fortunate to be working with some great non-profits, including Sarvodaya USA and Teach for Nepal, that were able to work together in the Nepal earthquake relief and recovery efforts using Qlik. I wanted to share with you a glimpse of how that works. Within 15 minutes we were able to take a custom relief spreadsheet with districts, villages, supplies, calculations, etc. And visualize it all in Qlik Sense. This gave us a much better view of the impact Teach for Nepal could make in various villages, many of which are rural and unable to be reached immediately by some of the larger emergency Non Government Organizations (NGOs). They also used Qlik to get a much better handle on the donations and donor mix. From a CSV output of PayPal, within minutes, Teach for Nepal was able to plug this data into Qlik Sense. It provided their treasurer with a much better understanding of how they were doing day in and day out, and where the donors are coming from. Now they can quickly and easily see how they're doing as far as overall goal and reach are concerned. All in all – Qlik has given these organizations the ability to view information and speak more clearly to the overall impact – much faster than they were able to before. This type of analysis of the data collected would have been months after the disaster, only telling them: How did we do? Now, with Qlik, they can confidently say How are we doing and what do we need to do to make a faster, bigger impact?